Summer is right around the corner and I know the Stampin' Up! demonstrators are busy preparing for the new Annual Catalog and the treasures within. As you are planning your classes and workshops I thought I would provide another masculine option for the exclusive Stampin' Up! Dress Form Pop 'n Cuts insert and Pop 'n Cuts Card Base. This Uncle Sam outfit will obviously be great for 4th of July cards, but could also be used for any type of Patriotic card, especially for the troops. I'm giving you some options for this *FREE* template. You can download it as a PDF for hand-cutting, like I offered for the Tuxedo Template, or you can also download an SVG file with the pieces ready for your e-cutter. If you have an eclips and eCal software, you can download the SCAL3 file, where I have separated the four colors onto separate tabs and changed the shoulder lines to scores. Now you can definitely use Uncle Sam on his own with the Dress up Framelits Dress form for a card front or on a layout, etc. In that case, you can choose to put his hat higher and/or have him hold the hat in his hand. Have fun with it! Upper Body - white shirt, followed by blue vest, followed by coat sides. Tuck white shirt sleeves under the coat sleeves and secure. Add the blue lapels. Add the bow tie, making sure it is low enough to leave room for the hat. Draw black buttons on the shirt and white buttons on the vest. Pants - white pants followed by red stripes. Hat - white hat, followed by red strips, followed by blue hat band, then white stars and white hat brim. Use a craft knife to cut a slit below the hat brim as shown. STEP 2: Slide the hat over the body and secure on the back with glue or a piece of tape. STEP 3: Turn the piece back to the front. STEP 4: Die cut and fold a Pop 'n Cuts Dress form. Trim off the shoulders of the pop-up dress form. STEP 5: Add the pants to the bottom of the dress form, just slightly above the ground so they won't bunch in the fold. Add a strip of Sticky Strip to the front of the dress form. Lay the upper body piece flat in front of the dress form and arrange it so the hat is within the card. Center it in front of the dress form. STEP 6: Peel up the liner on the tape and carefully bring the top of the card down to stick the dress form to the back of the upper body. Trim any part of the top of the dress form that still shows on the front of the card. For my card, I used a Whisper White backing card and embellished the card's interior with Polka Dot Parade DSP and some stamped images from the retired Independence Day stamp set. I also used the Adorning Accents Edgelits to make some decorative borders. I had already added the backing card before deciding that I wanted my firecrackers to be on pop-up platforms. This meant that I couldn't do a simple parallel-slits box cut on the "shelf" area of the Pop 'n Cuts, so I made simple box pop-ups from scrap cardstock instead. The front of the card is a very simple flag-inspired design using the leftover DSP and another stamped star banner. Demonstrators, you may distribute this template to your customers and use it for samples, workshops and classes as long as you are using it as a sales tool to promote the Pop 'n Cuts and Dress Up Framelits dies. Please give credit for the source as karenburniston.com. Thanks! So who's ready to make their own Uncle Sam Pop 'n Cuts card? Send me a link - I'd love to see your creations! The Stampin' Up! exclusive Pop 'n Cuts Card Base, Dress Form Insert and matching Dress Up Framelits are perfect for a Mother's Day card. For this card I decided to go with an elegant theme, using a Stampin' Up! stamp set I just received last week Papaya Collage, and Fan Fair Designer Series Paper. This paper just hit the Retired List yesterday, so get it while you can at a discount! For the card front, I used a craft knife to cut along the right edge of the Eiffel Tower so I could tuck two of my stamped and colored roses underneath. I used the Labels Collection Framelits for the title block. The "Wonderful Mother" stamp is Stampin' Up!, but from a retired set. Inside the card I was delighted to find out that my idea would work - to "frame" Mom's dress using the stamp. It was the perfect size to attach to the front of the table legs. If you'd like the table to more closely resemble a table, however, then try using scraps of the same patterned paper as the card's interior inside the backing card before gluing in the Pop 'n Cuts card. This will put the same "wall" and "floor" color behind the table and dress form. Post-it notes work great for masking off the table area for inking and stamping. I rarely bother masking the dress form itself because most often I'm using the companion Dress Up Framelits, which will cover the dress form. The masks allow me to sponge and stamp all over the table, changing its look entirely. For the frame itself, I tried the emboss-in-clear-and-then-iron-it-off technique that is so popular right now. (That's my lazy way of avoiding figuring out and properly crediting where I first saw this technique. Kelly Booth maybe?) I stamped the frame in clear Versamark ink onto Whisper White cardstock and embossed with clear powder. Then I sponged Island Indigo ink all over the frame. I used an iron with scratch paper to heat up and remove the clear embossing powder. As the iron melted the powder, it was transferred to the scratch paper. The resulting frame has a crisp white design with a matte finish. I like this technique! I'll be using it again. Go ahead and leave a comment below if you invented it - grab your glory, smart person! For the dress, I first die cut a dress from the Fan Fair DSP and then used scissors to snip the waist from both sides, leaving only a small portion held together. I fanned out some score lines and accordion folded the bottom half of the dress, creating pleats. I brushed the tops of the pleats with ink and then smoothed out the dress again. I added a strip of DSP at the waist to cover the cut lines and also added a decorative button from my stash. A little rhinestone necklace finished off the look. The frame is attached to the front of the table legs and then for some added drama, I knotted some ribbon through holes in the top corners and attached the ribbon to the back of the card with a decorative brad. You'll have to do this before attaching the backing card so the brad prongs will be hidden between the layers. This particular piece of paper has a slight amount of red detailing. In the upper right corner are some red postmarks. I felt that the red needed to carry through somewhere else on the card, so after die cutting the greeting I left the paper in the Framelits die and traced it with a Stampin' Write marker to add the thin red line border. The "My Mom" is also a Stampin' Up! stamp, but from a retired set. The finished card is a standard A2 card, fits in a regular envelope and mails for a single stamp. Wouldn't your mother love a card like this? She's done so much for you, I think it's only right that you invest in these dies to show her how much you love her. Do it for Mom! Next week I'm heading to Massachussetts for The Collins Rep Group's Spring 2013 Education event. This event is for retailers to gather education ideas to use in their stores. I will be teaching a Pop 'n Cuts class using the new Journey collection, shipping in June, 2013. There is also an evening with Make 'n Takes. Retailers can make their way around a large ballroom making quick projects from all the manufacturers. With the popularity of the Accordion Album and companion Frame & Label Bracket dies, this is a set of dies that I'd like to see in every store with a display sample to show how the dies work. My Make 'n Take will be this simple Accordion Album project. Retailers can choose to make the album in the red color scheme or the yellow. Bazzill provided my favorite cardstock for this album - the ultra sturdy and smooth Card Shoppe, which now comes in 12x12 size, meaning you can make a 4-page album from one piece of cardstock! AWESOME! The patterned papers are from the new Bazzill Mac collection, by Heidi Lynn Schreiber. The "Celebrate" greeting is a Hero Arts stamp. Now, the title of this post promised some "spots" and spots you shall see! I'm going to dedicate this post to the Accordion Album die, which is back in stock at retailers if you act quickly. Check with your local store first - we really need to support our local retailers or we aren't going to have any! Just sayin'! First up, Donna Gibson's absolutely AMAZING Parisian album. She has close-up shots of each panel set on her blog post, so don't miss the opportunity to click and drool. She even decorated the back of the album! For this album she used both the Album and Frame & Label dies and linked together 6 panels of the album. 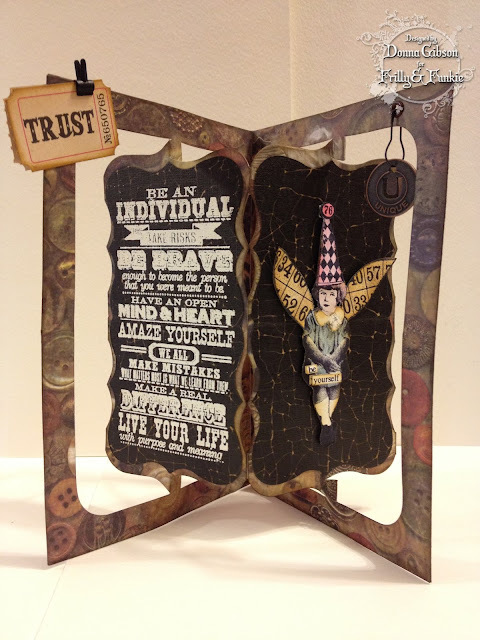 While you're falling in love with Donna's blog, make sure you also check out her Be Yourself Doublehigh Album Card. This is a perfect illustration of how versatile this die is. You can use it standard height (see above) or double height (see below) by following my Doublehigh Accordion Album tutorial. You also get to pick how many panels you link together. Donna used 6 panels for Paris and 2 panels for Be Yourself. Speaking of doublehigh albums, this project by Anna-Karin Evaldsson made my jaw drop doublefar! You simply must click over and see a close-up of that globe. Everything about this project is amazing! Kelly Booth shows yet another adaptation of the album, which is to fold the inner panels with the same valley fold as the outer frames. This creates a fifth panel (the back of the first panel) for the front of the album. Click on over to see the fifth panel, featuring more of her incredible Copic coloring! Shelly Hickox and I have decided we have synergy, which I always thought meant "loves to procrastinate with text messages and Scramble games" but apparently it means we feed off each other (creatively, not zombie-ly) and have been known to come up with similar ideas. A while back and unbeknownst to either we were simultaneously working on versions of the Accordion Album cut from a clear material to achieve a floating effect. My project was a belated birthday card for Kelly. I chose to keep the outer frames as the "clear" part of the album and added the Tim Holtz Pediments die on top of the album. 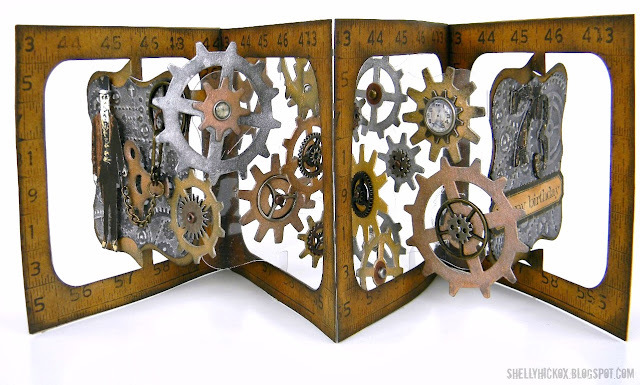 Shelly also used clear panels in her Time Machine Birthday card, but used the inner panels as the clear parts, even adding another pop-up die to the mix to give her even more clear platforms for her gears. The other great thing about synergy is that it is contagious! After these two clear projects were posted there was a wave of great clear album projects and clever adaptations showing up on blogs worldwide! Well I could go on spotting all day, but I've got to finish up some class kits for tomorrow's "You Make My Heart Sing" Album class. 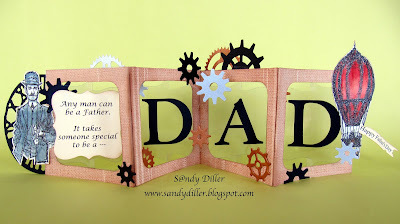 What will you create with the Accordion Album and Frame & Label, Bracket dies? 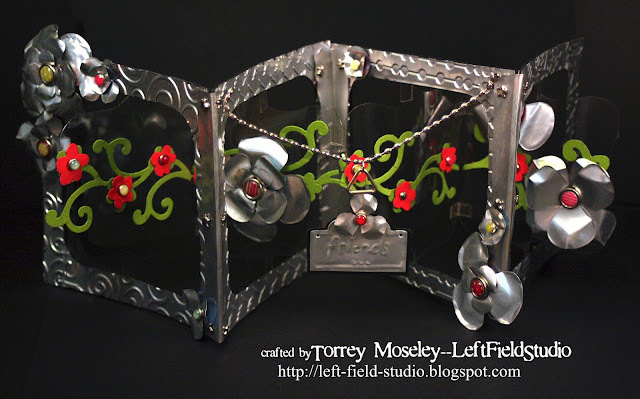 This Saturday, April 13th, I will be teaching this pop-up mini-album class at Scrapp'n Savvy in Spring, TX. There are some seats left if you're interested. The cost is $35 and includes all materials to make the project as shown. Optional after-class purchases to decorate your album further will include a coordinating alphabet sticker sheet and a paper with journaling cards and captions. If you'd like to make more of these albums in other colors you can also purchase Karen Burniston products after class including the Echo Park Interactive Chipboard Album, the Pop-up Heart die, the Photo Wheel die, the Love Sizzlits Set and the Heart & Wing Movers & Shapers set. The front of the album features a waterfall card with a bit of a twist - I've used the Pop-up Heart die three times to make it a pop-up waterfall feature. I am never a fan of things "flopping" in mini-albums, so there is a heart twist closure to keep the waterfall secured to the page when not being used. Simply spin the heart out of the way before pulling. 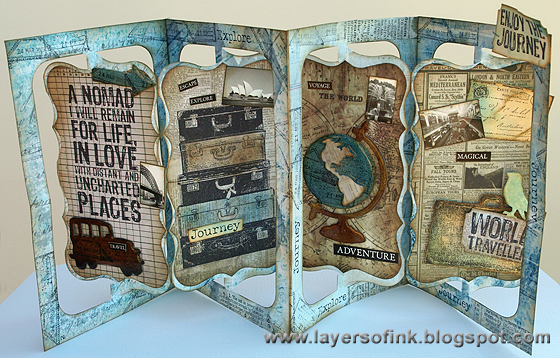 The chipboard album has built-in pull-out pages, making it the perfect choice for a pull-tab pop-up. I simply attached the end of the waterfall's pull tab to the album's tab so that pulling out the page will also engage the waterfall. Each of the three waterfall spreads features a pop-up heart with room for photos, journaling and embellishments. I did a modest amount of decorating of my album to show some ideas, but the choices are all yours for how to combine your photos, journaling, stickers and embellishments. Your kit will include the embellishment sticker sheet that you see featured on my pages. Inside the album are two more spreads to hold photos and journaling, plus the pull-out pages. On the final interior page is a Photo Wheel. I thought it would be fun to cut the front of the photo wheel from Bazzill Plastic Paper (also available for purchase at the store) so all the photos are visible, but then when you spin the wheel one photo is highlighted in the window with a white frame. The back of the album also has a pull-out and space for more photos. This album can hold a lot of memories! The papers are all from Echo Park's For the Record 2 "Documented" collection, by Lori Whitlock. I love this collection and how gender-neutral it is. Decorate your album with photos of anyone (or anything) that makes your heart sing! White Sharpie or paint pen (if you have one) to highlight the photo wheel window frame. I will bring mine to share. My second project for the current UStamp with Dawn and Friends event has been posted to the site. Members can log in and get access to the PDF supply list/instructions plus a private video tutorial for how to create this card using the Stampin' Up! exclusive Pop 'n Cuts Card Base plus the Dress up Framelits. This is the third time I've been a guest designer for Dawn's events and I have enjoyed every one of them. I have already agreed to design for her next event as well. What's so nice about these worldwide online events is that a new project is posted every 12 hours but you can log in at any time and view/download/save any of them. There is a photo gallery where you can upload your own versions of the projects and live chats where you can interact with the other students and designers as well as meet new friends and win fabulous prizes! The majority of the designers and students are Stampin' Up! demonstrators, who find the projects very helpful for re-teaching to their customers. For example, Cyndi is registered for the event and taught my first project, the Floating Framelits Card, to her customer, the fabulous Shelly Hickox, and together they made this gorgeous version of the card, including taking the idea further with additional techniques. You do not, however, have to be a demo to join this event. You just have to love Stampin' Up! products (and who doesn't?) and love being inspired by cool ideas! For National Scrapbooking Day Weekend, May 3-6, 2013, I'll be heading to Scrapbook 'n Such in Wichita Falls, TX to teach a Pop 'n Cuts card class, plus I'll be doing several demos of Sizzix dies and machines, including the eclips. I am sending a set of original cards to the store, but in the meantime, here is a video preview of the class projects so you can see them in action. 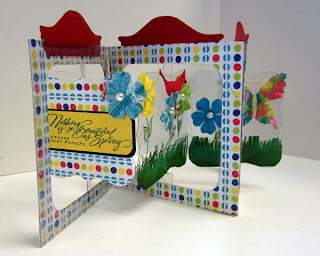 Today I'm blogging on the Sizzix blog with a video tutorial for how to assemble the Bigz Circle & Ribbon Platform die. My inspiration for the video card was my completed Tim Holtz 12 Tags of 2013 April Tag, which I made first, then decided to expand into a pop-up card. For the tag itself, I generally followed Tim's instructions for the background, although my patina ended up a little muddied, so I sanded it and overstamped some words in Broken China Distress Paint (my favorite!). I used birds from the Artful Flight stamp set. I carried through the same styling and colors from the tag into the card's interior, which features the Bigz Circle & Ribbon Platform die. You will see additional photos of the card on the Sizzix Blog post, plus a supply list for the video card and links to great cards by other designers using this die. What I love about the Circle & Ribbon Platform die is how generic it is. It has no theme, so you'll be able to use it for anything. It can also be used to animate larger objects, as shown in the PDF instruction sheet. This card combines Jenni Bowlin papers and embellishments, Bazzill cardstock, and some of my other dies from the Hello Sizzlits set, Birds on a Wire Sizzlits strip and Bigz Fancy Frame die to create an eclectic collage-style "Create" crop night invitation. If you're looking for a great all-purpose pop-up die that you'll be able to use year-round for any occasion, the Bigz Circle & Ribbon Platform die is a great choice! You may recall that I am trying to work through all the March birthdays I missed by posting very thoughtful belated birthday cards here on my blog and then also posting those cards into other challenges, galleries and whatnot before sending them (quite thoughtfully!) to their intended recipient. There's a funny little story that goes along with this card. The challenge is now over, but the idea of chaining the flowers together came to me when I was working on that challenge. I ended up making the Doublehigh Accordion Album Tutorial with Tattered Floral Rosettes project instead, primarily because I reminded myself that as much as I adore everyone else's product lines, especially my awesome collection of Sizzix dies from other artists, I'm sort of supposed to be, you know, promoting my own dies when I can, and doing a whole tutorial for how to chain the flowers together to make a cool pop-up card in total absence of, you know, any of my own product, was maybe not a smart, you know, business decision! Here's the thing. I never have a shortage of ideas, but I run pretty darn short on time to execute them. Plus, I'm a slow crafter. There are so many amazing designers who have been using my dies and it is especially thrilling when I can just pass off a technique via a blog tutorial, Pop-up 2Torial, or even just a text message, to a fabulous designer who will then do that technique ever-so-much-more-fabulously than I did, or would, or thunk, or whatever. CHAPTER THREE: Shelly says "Look chick - I don't need your help, 'mmmkay?" Actually she didn't say that. What she said was "I have my own killer idea for this die but that's pretty cool. You should do something with that." or something similarly pleasant and complimentary. And, side note, she really did have a killer idea and if you want to join me in feeling utterly out-crafted feel free to check it out here: Shelly's Tattered Florals Birdcage of Awesomeness. I took Shelly's excellent advice and promptly did something with my "go-by" sample. I put it on the kitchen desk and forgot all about it. CHAPTER FOUR: Doublehigh Accordion Albums rock da house! I can't regret my decision not to chain the flowers for the THTF challenge because, as a result of that Doublehigh Accordion Album tutorial, numerous amazing designers took the idea and ran with it. YESSSSS! There was a gorgeous card by Helen Cryer, an amazing album by S@ndy Diller, Shelly's March TH Tag and, most recently, Shelly's Treasure Each Day card. Just to name a few! WOW! The Accordion Album die has come into stock and then promptly gone back out of stock at numerous retailers because of all the awesome Accordion Album ideas being posted. I believe it is back in stock at IE and you can get a link and discount code from Shelly's Treasure Each Day post. CHAPTER FIVE: What's that clickin' noise? In this chapter I decided to clean up the kitchen in preparation for John's cousin Jessica to come visit for Easter weekend and came across a matboard card sitting on the kitchen desk and said to myself "What's this?" (What's that clickin' noise?) Then I opened it and said "Hey! This is pretty cool! I should do something with this!" Turquoise Mist (I used Tattered Angels) to change the primary color from Gold to "gold-undertones". Creative Impressions pre-made plastic leaves. See? I used some of my own dies! I'm a good self-promoter! Heh.